I spent a couple hours last week looking for Toronto in Dublin, Ireland. I’m always mentioning Toronto events inspired by countries like Ireland, so a switch was only fair during my one week trip to Ireland. 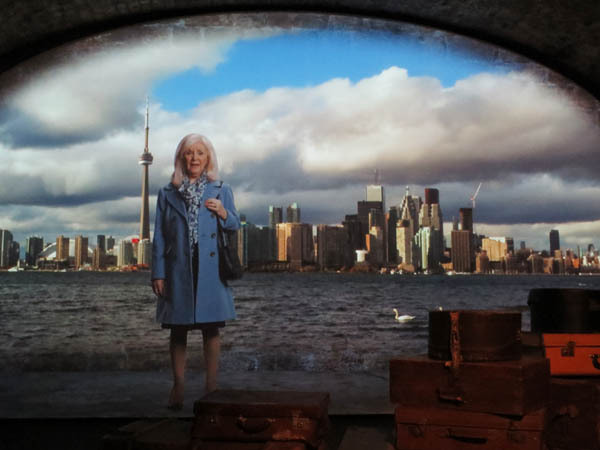 I found a bit of Toronto in the relatively new EPIC Emigration Museum. 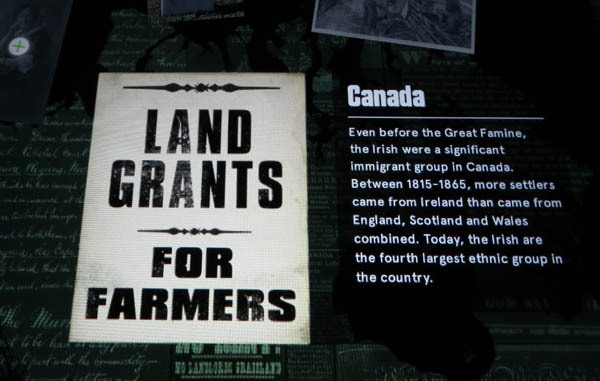 One item in an exhibit there showed emigrants talking about their experiences in their new country. A woman named Anne Carey, who is “still living in Toronto”, spoke in front of a picture of the CN Tower. Toronto’s latest census lists 543,600 people of Irish descent – 9.8% of our population. Then with a bit of a stretch, I included the Great Famine Monument about the disaster that started in the 1840s. The failure of the potato crop due to disease, was largely responsible for the death by starvation for over a million people. It forced the emigration of another million to places like Canada. Only a few meters from the front door of the Emigration Museum are statues by the same Irish artist Rowan Gillespie who made the Irish immigrant statues on Toronto’s waterfront at the base of Bathurst Street. 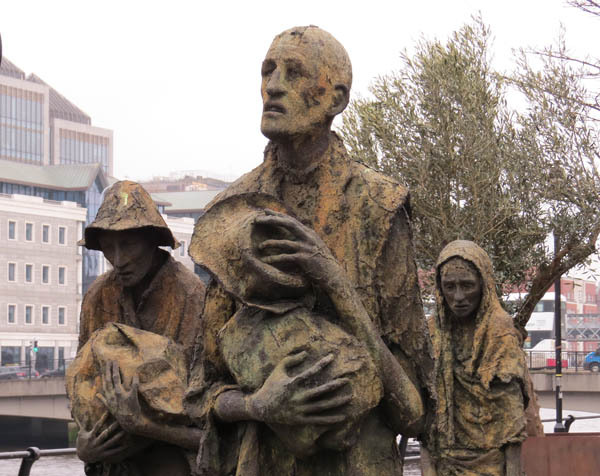 Yes, they do look similar in style and feeling but the statues express tragedy in Dublin. The Toronto ones exude hope. But if we consider the whole of Canada and not just Toronto, this museum has a lot to offer visiting Canadians in general. 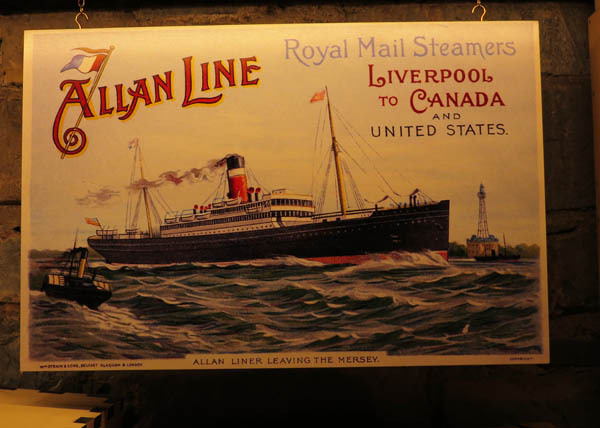 I found old posters advertising voyages to Canada and free farm land. 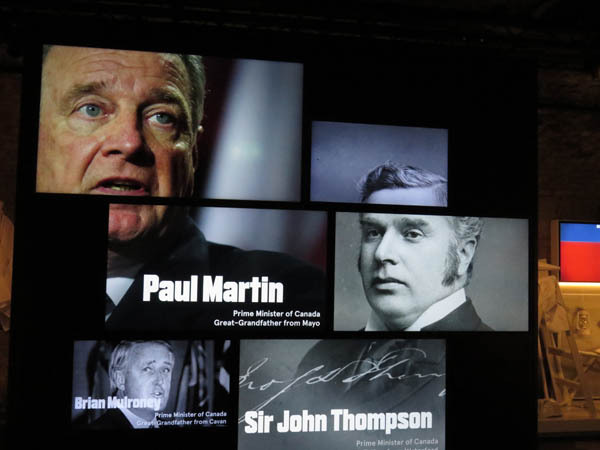 Of course, I recognized pictures of Canadian prime ministers of Irish origin: Mulroney, St. Laurent, and Martin. Less known was Canada’s fourth prime minister, Sir John Thompson who was also Irish born. Three of our Fathers of Confederation are mentioned too. Aside from the Canadians, U.S. Presidents Obama and Reagan were both shown holding cans of Guinness Beer. Was there something in Irish water or was it the beer that prompted Irish sons to take leadership roles abroad? The museum is worth a visit for its presentation. Its stories and pictures are fascinating. Maybe you can find more Canadians there than I did. 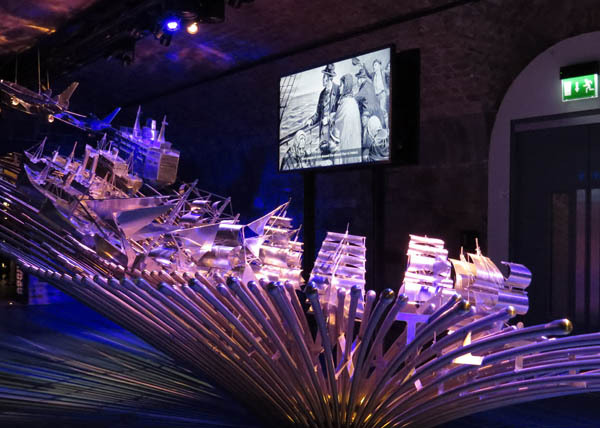 It is centrally located within walking distance of many other tourist attractions, the building originally used as a warehouse between 1817 and 1820 to store cargoes of tobacco, tea and spirits. The exhibits are in the basement level while a modern food and shopping mall are on the ground floor. On the upper level is an office that can help you search for your Irish ancestors if you have any. I can understand now why visitors from abroad to Toronto appreciate a few signs of home. Interesting post, Ruth. I had no idea 9.8% of Canadians have Irish heritage. That seems a lot, considering the strong anti-Irish sentiment in the 19th century. According to the 2016 Census, Canada has 4.6 million people of Irish origin.